THE USE OF THIS SITE IS GOVERNED BY THE POLICIES, TERMS AND CONDITIONS SET FORTH BELOW IN THIS USER AGREEMENT. PLEASE READ THIS AGREEMENT CAREFULLY. YOUR USE OF THIS SITE AND YOUR PAYMENT REQUEST FOR SELLABLE GOODS INDICATES YOUR ACCEPTANCE OF THESE POLICIES, TERMS AND CONDITIONS. Updated versions of these site terms are effective immediately. Your receipt of a quote summary or order confirmation signifies that iGolfValueGuide.com will only pay full value if the golf clubs and/or golf equipment sent are in the condition which is specified at checkout. By shipping your golf clubs and/or golf equipment to iGolfValueGuide.com you confirm your acceptance of our price and trade-in rules/information, which can be found on product and quote cart pages. If you do not wish sell your club(s), iGolfValueGuide.com online quote is valid for seven days. To receive full payment, all golf equipment must authentic, absolutely no fakes will be accepted. Counterfeit goods will be returned at owners expense or will be discarded. You must be the legal owner of the equipment being sold. If applicable, please include headcover and wrench with golf equipment. iGolfValueGuide.com is not responsible for any lost or stolen packages during shipment. iGolfValueGuide.com is not responsible for damaged golf clubs during shipment. It is the seller's responsibility to make sure golf equipment is safely and securely packaged before shipment. We recommend wrapping the golf clubs in newspaper if bubble wrap is not available. iGolfValueGuide.com attempts to ensure that information on this Web Site is complete, accurate and current. Despite our efforts, the information on this Web Site may occasionally be inaccurate, incomplete or out of date. We make no representation as to the completeness, accuracy or currentness of any information on this Web Site. For example, products included on the Web Site may actually carry a different price than that stated on the Web Site. In addition, we may make changes in information about price without notice. We reserve the right, without prior notice, to limit the order quantity on any product or service and/or to refuse service to any customer. 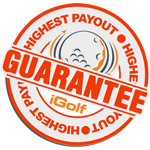 Payment will only be made for golf clubs that meets our equipment requirements, as listed above, if the golf clubs and/or golf equipment does not meet the terms and conditions, iGolfValueGuide.com will adjust the clubs value accordingly. Allow seven business days for check to arrive, three business days for PayPal, and Coachella Valley CA customers receive payment when iGolfValueGuide.com receives golf equipment. All content, including text, images, logos, concepts and technology on this site are the exclusive property of and owned by iGolf Value Guide and are protected by trademark laws. No content may be used or copied without the express consent of iGolf Value Guide. We may issue a warning or temporarily suspend, indefinitely suspend or terminate your order or any of your orders if (1) you breach this Agreement, (2) you provide us with false information or we are unable to verify or authenticate any information you provide to us, (3) you infringe the intellectual property rights of others or (4) you engage in any act of collusion or price manipulation.